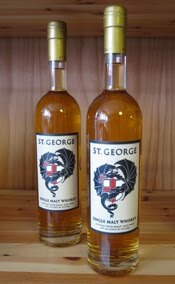 St. George is a single malt whiskey that is produced in Alameda, a town in the western American state of California. It is made by a company called St.George Spirits, which was founded in 1982 by Jörg Rupf. He arrived in California from Freiburg in Germany, where several generations of his family had run a successful business brewing beers and distilling eaux de vie (fruit brandies). St. George was America's first eau de vie distillery and it made Rupf one of the forefathers of the American micro distillery movement, which is currently booming. The St. George single malt whiskey was first released in 2000 and in addition their portfolio now includes numerous fruit eaux de vie, fruit liqueurs, vodka, absinthe (they were the first place to legally distill this in the USA since the early 1900s) and agua azul (a spirit made with 100% agave, but that can't legally be called tequila). This boutique single malt is released at 3-4 years of age and is bottled at an alcoholic strength of 43% ABV. It is still hard to find in the UK and is very much in the domain of the independent specialist whisky retailers such as Royal Mile Whiskies or The Whisky Exchange. So, not the English stuff then? It is easy to confuse the two, as the English single malt whisky that has recently hit the market also carries the name of St. George. This is compounded by both having the St. George's cross and a dragon on their labels! The American single malt is made using barley grown in California and this is heavily roasted once the germination stage of the malting process has taken place. They then smoke the barley over beech and alder wood and the smoke is imparted to give different and smoky flavours. Once fermented, the wash is distilled in small batches in the smallest commercial pot still in North America. Only 50 gallons (190 litres) of single malt are produced a day and this is then mostly matured in ex-bourbon casks. Other casks, such as French oak and Port, are also used occassionally. The colour of this St. George single malt is a light golden yellow and the nose is full of youthful vibrancy. The nose has plenty of bourbon cask influence - vanilla, honey, oak, cereals and toffee - but has an unusual edge to it. This 'edge' is reminiscent of hops and gives the whisky a distinct aroma of a hoppy beer or ale. There are also notes of green apple and citrus zest (especially lemon). On the palate, the freshness from the nose is maintained with the crisp apple and lemon zest particularly prominent. These are followed by some creamy vanilla, sweet honey and slightly bitter cereal notes. A hint of raw spirit, the hops from the nose and a hint of warm spices (think of ginger and nutmeg) round things off. The palate is reasonably basic and refreshing but tastes different to most other single malts that we have sampled to date, mostly because of that hoppy note. The finish is short and initially sweet with the honey and vanilla evident, before it turns drier and slightly more bitter. The nutmeg spice reappears right at the end. A young but very interesting whiskey. 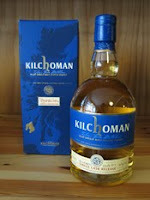 Kilchoman (pronounced kil-coe-man) is one of Scotland's newest whisky distilleries. It is located on the western side of the famous whisky island of Islay, which lies off the Scottish west coast. The distillery is named after a local church parish and is brand new - the first spirit was produced in June 2005. Kilchoman is independently owned by the Kilchoman Distillery Company and has an annual production capacity of around 100, 000 litres, making it one of the smallest distilleries in Scotland. It is already building up a cult following of whisky drinkers and attracts over 10,000 people a year to its visitor centre. The first official single malt whisky from Kilchoman was only released in November 2009, once it had reached the legal age of three years and was allowed to be named as whisky, and has received rave reviews. Prior to this, Kilchoman had released a series of bottlings of their new make spirit that had been aged between one month and two and a half years. This bottling is from a single cask that was specially selected for whisky retailer Royal Mile Whiskies. The whisky was distilled on 22 May 2007 and bottled just over three years later on 4 June 2010. There are only 264 bottles available and its alcoholic strength is 61.7% ABV. The retail price is £59.95. We thank Michael Hopert and Matt Tilbury at Royal Mile's London shop for the chance to sample this exclusive whisky. Royal Mile Whiskies is one of the UK's leading independent whisky and spirits retailers. The company was established in 1991 and has established a worldwide customer base. They currently have two shops - one on Edinburgh's Royal Mile (hence the name!) and one in London's West End - with a third shop in Edinburgh specialising in cigars. Royal Mile Whiskies have one of the best whisky retail websites on the net and in addition to an expansive range of whisky, bourbons and other spirits, the website is also home to in depth distillery profiles, whisky history and staff tasting notes. It is well worth a visit - www.royalmilewhiskies.com. The colour of this whisky is light and golden. The nose has an interesting combination of vibrant freshness and rich smokiness - the aromas coming through include toffee, fresh green fruit (think of pears, apples and greengages), vanilla, citrus (imagine lemon zest), a hint of something spicy (reminiscent of peppercorns) and plenty of woody bonfire smoke. On the palate, this is initially crisp and fresh but feels sweeter and less savoury than the nose suggests. This sweetness has elements of honey, vanilla and icing sugar to it. These combine well with the slightly acrid but pungent peaty smoke (this feels slightly more ashy than on the nose), some distinct cereal grains and the fresh green and citrus fruits - the overall feeling remains clean and refreshing. It ends up being creamier with more vanilla coming to the fore. The finish is long, vibrant and sweet with that vanilla and woody bonfire smoke prominent. The smokiness burns away before fading in your mouth and it becomes dry towards the end. As mentioned, most Kilchoman releases to date have received rave reviews. It is easy to see why as they show much potential and seem a little older than their young age would suggest. This Royal Mile bottling is another example that shows this potential and much quality. Having said that, it is still very youthful and gets you thinking about how good the whisky from this distillery could be in the future. Let's hope that temptation to meet demand isn't fully followed and some whisky survives to prove or show the point. This is by no means the finished product and people need to remember that before getting carried away, but it's a good and promising start! Situated on a hillside overlooking Willamette Falls, the Highland Stillhouse is a pub and whisky bar located 30 scenic minutes southeast of Portland, Oregon in the United States' beautiful Pacific Northwest. The current owners, Tammy and Mick Secor, have been visiting Scotland and her distilleries for the last twenty years and have decorated their bar with mementos from their personal collection (peat cutters, old whisky posters, personal pictures of distilleries and distillery managers, to name just a few). 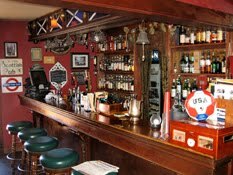 Upon first walking into the second floor "snug bar" (Tammy's name for the cosy public bar - the lounge is located on street level) I felt like I'd walked into the Highlander Inn in the town of Craigellachie in Scotland's Speyside region. The bar boasts over 200 single malt whiskies, an additional 100 "world" whiskies and quite a few beers to boot (over 60 from Scotland alone, and even two cask conditioned "real" ales on tap). They also serve great food. For more information, check out their website www.highlandstillhouse.com or follow along on Twitter (@StillhousePub) or Facebook (The Highland Stillhouse Pub). The building dates from 1925 when it was a petrol filling station. In 1926, the owner of the filling station installed a cafe and ran both ventures through the end of the 1950s. At that time the filling station was closed and the entire downstairs became Art's Cafe, with the upstairs providing living accommodation. Tammy and Mick purchased the building in 2005 and spent one year renovating both the downstairs and the upstairs. The addition of a covered deck allows patrons a chance to sit outside and enjoy the picturesque scenery with a pint and a dram... and maybe a deep fried haggis ball! Like the best whisky bars the Highland Stillhouse barkeep presents you with an informative whisky menu when you inform them of your desire to sample a tasty treat from their collection of over 300 whiskies. The menu provides information on 'usquebaugh' and Scotland's five whisky regions. The offerings are separated according to region. Then there's a list of world whiskies, blends, and single grain whiskies. There's even a map of Scotland on the back of the menu so you can source your selection. When you find out that Tammy's license plate reads "ARDBEG" you won't be surprised to discover that the whisky menu favors releases from that particular distillery located on Islay's south shore. The Ardbeg options include Provenance 1974 ($169 a dram), the highly sought after 17 Year Old ($46.75 a dram), Rollercoaster ($34.50), and the rest of the current line. Special bottlings from other distilleries include a 24 Year Old Brora ($38.50) and a 22 Year Old Port Ellen from Connoisseur's Choice ($46.75). However, before you start thinking this bar only serves high rollers you should know that the majority of the whisky menu features whiskies priced between $4.50 and $15 so there's plenty of choice for those of us on a budget. Mick offers a monthly sampler where you can purchase three whiskies for $20 and often leads his own whisky tastings. Whisky is poured in 1.5oz measures and served in a Glencairn glass with a pitcher of bottled water on the side. Pints come in 20oz glasses (rather than the US's standard 16oz pour). During my time at the Highland Stillhouse I was fortunate to share a pint and a dram with Tammy and Mick while I listened intently to their tales from twenty years of visiting Scotland and meeting individuals whom I've only read about in books and magazines. They are both terrifically warm hosts and run a beloved local establishment that has won its fair share of awards in the relatively short time it's been open. If you find yourself in the vicinity of Portland, Oregon I highly recommend dashing down I-5 and across 205 in order to take advantage of what the Stillhouse has to offer. When you see 15,000 foot Mount Hood rising up to greet you, you'll know you're in Highland territory. We thank Jason Johnston-Yellin from the Guid Scotch Drink whisky blog for writing this review and supplying the interior and exterior photos of The Highland Stillhouse. Be sure to check out his excellent and informative blog, if you haven't already - he can also be followed on Facebook and Twitter (@GuidScotchDrink). We can now remove the intermission/test card sign and resume normal service! Whisky For Everyone has been quiet for the last two weeks, as we make our annual pilgrimage to Spain and the Benicassim music festival. This year's festival included notable performances from bands such as Kasabian, Gorillaz, The Temper Trap, Leftfield, Goldfrapp, Foals, Calvin Harris, Two Door Cinema Club and DJ Shadow. To be honest, very little whisky has passed our lips over the last two weeks (despite the picture below! 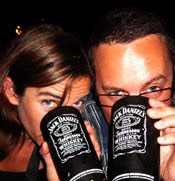 - where we can be seen enjoying a can of pre-mixed Jack Daniel's and cola, which is massive in Spain) and we have come back refreshed, ready to discover more good whiskies and write our reviews. We have also been planning another project, which we will announce in time. In our absence, we have an article written by Jason Johnston-Yellin of the Guid Scotch Drink, which is becoming an increasingly essential read for whisky lovers and remains one of our favourite whisky blogs. We are delighted that Jason has agreed to write something for us. His article will appear shortly and forms part of our occasional series, 'Great places to drink whisky ...' . We thank everyone who has continued to visit Whisky For Everyone during our 'intermission' and look forward to hearing from you again, now that we are back. 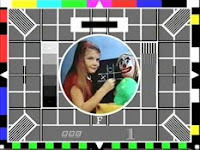 We will also be replying to all correspondence that we have received over the last two weeks as quickly as possible. Glenfarclas is a distillery located in the Speyside region, close to the small town of Ballindalloch. It is owned by J&G Grant and is the second oldest family owned distillery in Scotland - the Grant’s have owned it since 1865. Only Springbank in Campbeltown has been owned by the same family line (the Mitchell's) for longer. Glenfarclas translates as ‘the valley of green grass’ from Gaelic. The distillery has an annual production capacity of three million litres and boasts the largest stills in Speyside. They are also renowned for their use of quality European ex-sherry oak casks for maturation and release a comprehensive core range of single malt whisky. George Hay founded a distillery on the current Glenfarclas site in 1836, although records show that an illegal farm distillery had been operating there since 1797. He named the distillery as Rechlerich. In 1865, it was sold to neighbour John Grant and here started the second longest continuous line of family ownership in Scottish whisky history. In 1896, the distillery was completely rebuilt by John’s son, George, and with that came increased production and success, along with the name changing to Glenfarclas. The distillery continues to be owned by the Grant family to this day (currently on the 6th generation) and the core range includes a 10, 12, 15, 21, 25 and 30 years old plus other limited single cask releases. This 40 years old is the eagerly awaited new addition to the range, having been launched during the recent Spirit of Speyside Festival in April 2010. The whisky was distilled in the late 1960s, has bben maturing in ex-sherry casks ever since and has been specially selected from casks by George Grant, a 6th generation descendant of John Grant and a current director of the company. It is bottled at 46% ABV and can be found for £300-350 from specialist alcohol retailers. The colour of this whisky is a dark brown amber. The nose has a great intensity and depth, with an initial sweetness that quickly turns towards drier notes. With time, more aromas start to develop and the combination is sumptuous but challenging. Sweeter notes (think of vanilla, toffee, brown sugar and dried fruits - raisins, dates and prunes) mix with darker (especially treacle and dark chocolate) and more savoury ones (imagine beeswax furniture polish and damp oak). There is also a distinct aroma that is reminiscent of spiced orange. On the palate, this is surprisingly vibrant for a whisky of this age. There is an immediate hit of wood spices (think of ginger, cinnamon and nutmeg), followed by sweetness that is led by dried fruits (the raisins and prunes again, in addition to some candied orange peel), butterscotch and brown sugar. The comes more spiciness and this gives a bittersweet feeling and dries the palate. In short, this whisky is rich, intense and full bodied. The finish is long and lingering with plenty of dried fruits, wood spices and tannins. The combination makes the finish dry and mouth watering, with interesting hints of liquorice, clove and cocoa towards the end. 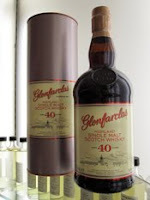 This Glenfarclas 40 years old is an excellent whisky but one that will not be for everyone's taste. It is heavy and rich yet has a pleasant, surprising and unexpected spicy vibrancy that makes it dry, dark and complex, after some initial sweetness. This whisky also offers good value for money for a whisky that has a 40 years old age statement, as many are in the £500-1000 bracket. We were delighted recently to announce that we had teamed up with Penderyn, the only Welsh single malt whisky distillery, to offer you the exclusive chance to win one of three 70cl bottles of their Penderyn Madeira Finish whisky on our blog. Both ourselves and the guys at Penderyn would like to give a massive thank you to everyone that took the time to complete the survey and enter the competition. 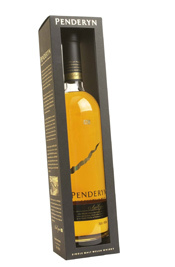 The winners will receive their 70cl bottle of Penderyn Madeira Finish shortly and we hope that you enjoy them! Bladnoch (pronounced blad-nock) is Scotland's most southerly distillery that is currently in operation. It is located in a remote spot, close to the village of Wigtown, between the towns of Dumfries and Stranraer - it is actually further south than parts of northern England, including the city of Newcastle! The distillery takes its name from the nearby River Bladnoch, which supplies the water for the whisky production, and was founded in 1817 by two brothers - Thomas and John McClelland. The distillery has had an intermittent history and has been closed and re-opened on a number of occasions. The most recent of these closures was in the mid 1990s. The previous owners (United Distillers, who later became part of Diageo) closed Bladnoch in 1993 and the distillery was purchased by Northern Irishman Raymond Armstrong in 1994. His aim was to help the flagging Lowland whisky industry (at the time only had two distilleries left - Auchentoshan and Glenkinchie - having previous had over 30). However, following legal problems with Diageo, Armstrong was not allowed to begin production until 2000 with production capacity capped at 100,000 litres per year (full capacity is around 250,000 litres per year). Initially, old stock from the previous owners was bottled and released, before in 2008 the first single malt produced during Armstrong's tenure was released. The current range is still expanding as more stock reaches maturity. This whisky was released in April 2010 and is taken from the old stock inherited from the previous owners. It was distilled in January 1990 and bottled in February 2010 at the natural cask strength of 52.4% ABV. The whisky was matured in ex-bourbon casks and should cost around £45 per bottle (a bargain for a cask strength whisky of this age) from specialist retailers. It represents the oldest distillery bottling of Bladnoch currently on the market, although older ones are available through various independent bottling companies. We thank Sue at Bladnoch for the opportunity to sample this whisky. The colour of this whisky is a pale gold and the nose is enticing, becoming even more so with time in the glass. The nose has an initial mix of vanilla, honey, stewed fruit (especially apples) and cereal grain notes. There is also a zingy, zesty lemon note that appears, along with something floral (this is hard to pin down but is reminiscent of a flower such as honeysuckle) and a distinct grassy aroma (imagine dried grass or hay - this element also increases with time). It is a promising and very interesting start. On the palate, this is light, fresh and vibrant - these characteristics can be lost as whisky increases with age. The palate reflects the order of the nose very closely with initial sweetness coming from vanilla, honey and cereals. Then comes the fruit with tangy lemon zest being followed by the softer, sweeter stewed apples and a touch of brown sugar. The cereal notes increase and join with the late developing dried grassy character to add balance and finish things off very nicely. There is also just a hint of some spicy ginger and a tiny pinch of nutmeg. The finish is long, fresh and very enjoyable with honey and vanilla combining well with cereals and dried grass notes. This Bladnoch 20 years old is lovely. It is as simple as that! The quality of the spirit shines through, as does the sympathetic use of good ex-bourbon casks. The alcoholic strength leads you to want to add water and it is still very good - the sweetness and grassiness really comes through, the alcohol and zingy citrus sharpness are softened but it still retains some vibrancy. This would be an ideal light, fresh summer dram or as an aperitif. It has certainly gone done well here in London's mini 'heatwave'! The Arran distillery is one of the youngest single malt whisky distilleries in Scotland. It was founded by an independent group called the Isle of Arran Distillers Limited in 1993 and production began in 1995. The distillery is located on the isle of Arran, near to the village of Lochranza. It became the first legal distillery on the island since the 1840s. The island lies between the Campbeltown peninsula and the west Lowland coast. Arran is also one of Scotland's smaller distilleries, producing approximately 750,000 litres per year, and they use numerous traditional techniques in their whisky production. Arran's visitor centre is one of Scotland's most visited, despite its relatively remote location. This whisky forms part of a large series of single cask and small batch releases. These involve the whisky being matured in a variety of different casks, including a number of different wine casks like the Sassacaia red wine cask that we have previously reviewed. This innovation and the series of whiskies have been widely acclaimed and this single sherry cask release is no exception. It is one of the older Arran whiskies available - it was distilled in August 1996 and bottled in February 2010 - and there are only 325 bottles. The Sherry Cask is bottled at its cask strength of 57.7% ABV and should cost £40-45 from specialist alcohol suppliers. We thank Selim Toussoun for supplying this sample. The colour of this Arran Single Sherry Cask 1996 is golden with an amber tint and the nose is very promising. There is initial aromas of vanilla and toffee, followed by some soft dried fruits (think of sultanas and apricots) and nuts (imagine hazelnuts and almonds). After a few minutes in the glass, there is also an interesting and slightly bitter edge that comes through - imagine a combination of cereal grains, oak and wood spices (think of cinnamon and nutmeg). The palate is very much a reflection of what is found on the nose - the initial sweetness of toffee and vanilla notes, then the dried fruits and nuts, then spiciness (imagine the cinnamon and nutmeg, adding in a hint of ginger). However, it does become very spicy with the ginger note increasing, along with the heat from the high strength of alcohol. The finish is long, sumptuous and spicy, although it does again begin with the sweet toffee/vanilla notes before the spiciness (especially the ginger and nutmeg) and a pleasant dryness kick in. 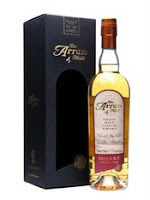 This whisky is another great example of how Arran whiskies are coming of age. Each time that we sample one of their whiskies, they just seem to get better and better, with more character and complexity. This is lovely and has good balance between the sweetness and the spiciness present. It is also decently priced for a cask strength single cask bottling - snap one up before it runs out! Today has seen the publication of the second meeting of The Whisky Round Table. The group was the idea of Jason Johnstone-Yellin, who writes the excellent Guid Scotch Drink whisky blog, and he has gathered together 11 other whisky bloggers from different locations around the world to take part. 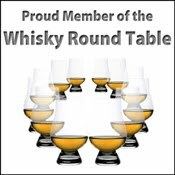 We are delighted to have been asked by Jason to form part of the Round Table and look forward to contributing to it in the future - the other blogs joining ourselves and Jason are Caskstrength, Edinburgh Whisky Blog, Glasgow Whisky and Ale, Jewish Single Malt Society, Nonjatta, The Casks, Whisky Emporium, Whisky Israel, Whisky Notes, Whisky Party. The idea is that the Whisky Round Table convenes once a month and the chair person sets a topical whisky related question that they have always wanted to ask. The chair person will change each month and rotate between the 12 Round Table members. Once the question is asked, each member will present an answer and this will be posted on the hosts blog when collated. The reader will then see 12 differing opinions and interpretations of the same question and this will hopefully introduce new ideas and approaches that may not have been thought of previously. How did you develop you "nose" and "palate"? What was your turning point for actually trusting what you were smelling and tasting? What do you do, if anything, to strengthen your senses and/or help your smell and taste to grow? The Ardbeg Committee is about to celebrate it's 10th anniversary with a series of special events. The Committee was founded in 2000 and the idea was that if enough people signed up, then it would secure and support the long term future of the distillery. Ten years later, Ardbeg have attracted a staggering 45,000 Committee members from over 90 different countries around the globe. Membership gives the opportunity to buy exclusive bottlings or to get first pickings for new bottlings, such as the recent Rollercoaster and the 2010 release of Supernova. It also gives other special offers and access to the exclusive member's area on the innovative and interactive Ardbeg website. If you are not a Committee member already and would like to join, then you can sign up for free on their website www.ardbeg.com. The Ardbeg distillery is located on the western Scottish island of Islay (pronounced eye-la), which is the home of the smoky style of whisky. It is located in the south east of the island and produces some of the peatiest, smokiest whiskies in the world. Ardbeg was founded in 1815 by John MacDougall, although records show that a distillery was operating on the site since 1794. The current owners are drinks company Moet Hennessey and the distillery has a capacity of approximately one million litres per year. Ardbeg was closed for lengthy periods in the 1980s and 1990s, before re-opening in 1997. The Ardbeg Committee was set up in 2000 to support the continued survival of the distillery and to ensure that it remains in production and never closes again. For details of two forthcoming UK events to celebrate the 10th anniversary of the Ardbeg Committee - click here.